Following the performance, we had professional practice lecture from a pair called Semiconductor. They consider their work as moving image and produce films and installations which are shown at festivals, in museums and more. 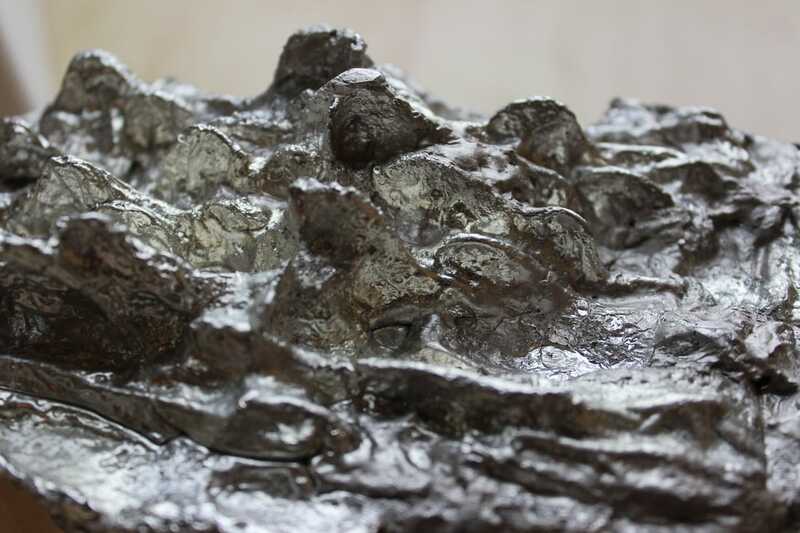 Their work considers the material nature of the physical world. Through technology and science, the pair aim to visualise the hidden using each as a language. 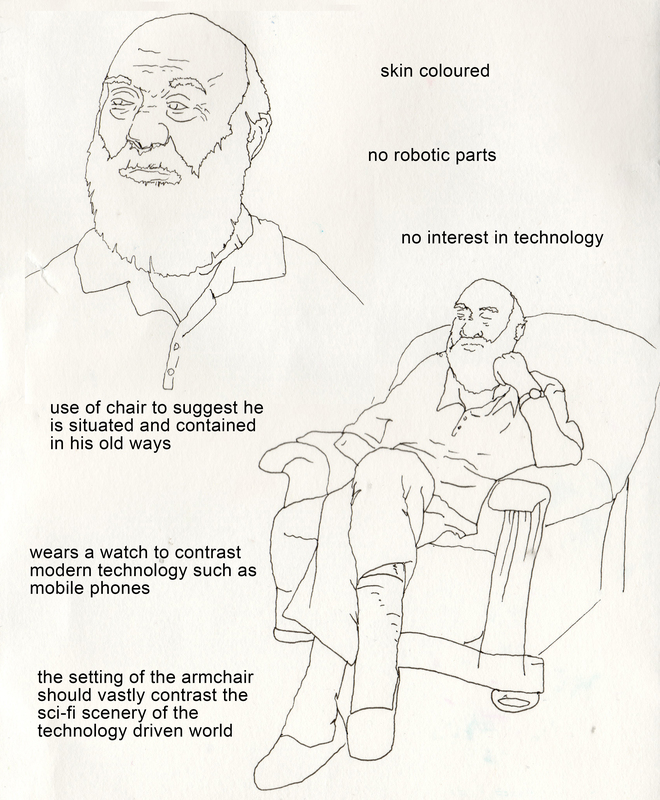 Since the development of the computer, the pair utilise its properties in a material way as opposed to heavily relying on the software and hardware within. 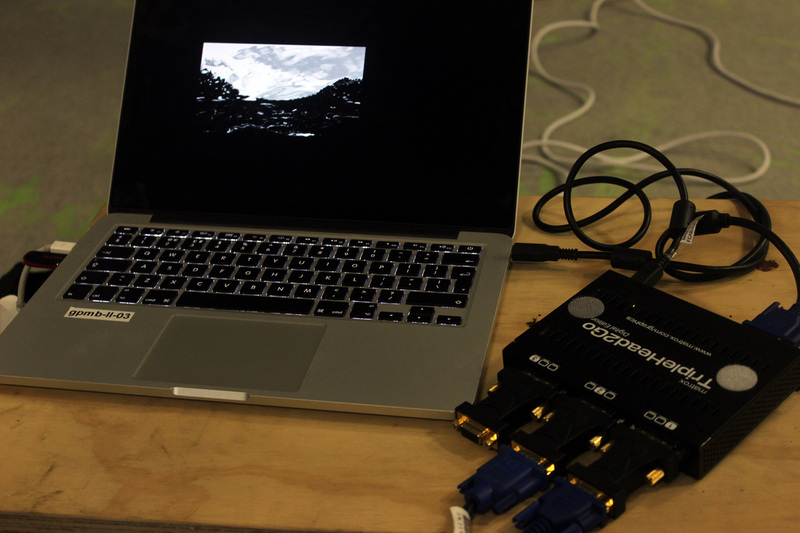 They experiment with audio and data to create their pieces. The pieces below show examples of how I could have developed my work for the projections further. In future I would like to further consider the involvement of sound within the process of image creation and could have utilised this by working with the sound department to use the data from their audio. The videos below look visually similar to mine and could be representative of water. Having gained this knowledge of Semiconductor's process, I am now aware of how to manipulate sound into visuals that looks water-esque. Earthworks installation documentation from Semiconductor on Vimeo. The final performance was a success! Luis was flawless with the transitions between scenes which really built up an atmosphere and it was clear that our selection of clips for each scene was correct in enhancing the energy and tone. The gel filters in the lights made the performance fun and warm to watch. A few elements of the actor's performance didn't go to plan however this added to the comedic effect of the overall piece and made it hysterical to watch. The costumes looked beautiful and the set also. The use of the curtain for the first 2 scenes was a brilliant decision and made the experience more intimate like you were watching a private cinematic film. This also set the tone well for the overall performance as the sheet was removed and the lights faded in. ​Below is a short clip of the opening sequence. Overall this project was far from my comfort zone however it was really exciting to work as one, big family. It was interesting to note how key communication was to success and how the deligation of roles became imperitive in getting things done in such a short time scale. I am really proud of how we all pulled together and how the visuals team in particular worked so hard and achieved so much. Without the visuals I feel the performance may have been lacking in atmosphere, energy and movement and, only on the night did it become clear this was the case. Hopefully the video of the performance will be available soon! I am very excited to see it! For now, here's the trailer made Harriet Pennington-Yates with music by Jake Twomey & Merran Arthur Coleman! 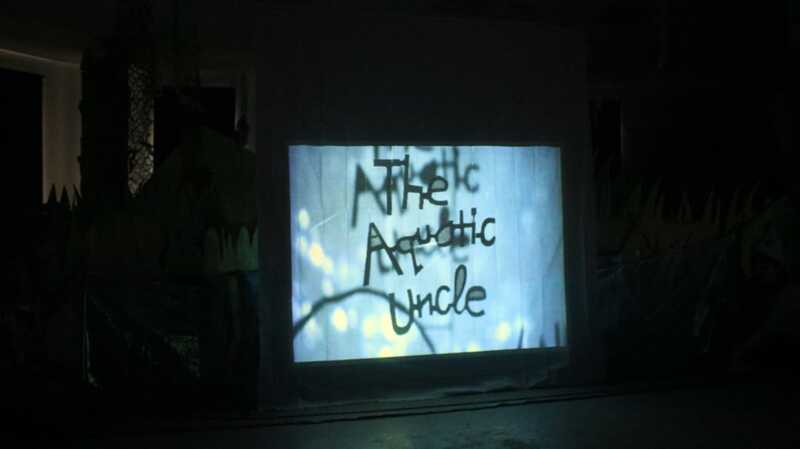 Our final preparations involved finishing the family photograph sequence and ensuring the projectors were all set up and working. Initially the family photos were meant to be exactly that, photographs however the costumes were not ready in time meaning Chloe stepped in to draw them instead. She sent me the drawings which I edited to give them a more vintage and worn feel since the dialogue alongside them was to be talking about the past in a nostalgic way. To do this I applied a grainy, textured background and adapted the colours to sepia. Jess then sequenced these for Luis to put into VDMX ready to trigger along with the dialogue. It was decided during today that the title sequence (scene 1A) and the family photograph sequence (scene 1B) were to be played on a sheet. This was to make them clearer else the set may have interfered with the shapes too much and, since these parts were fairly figurative, it made sense to pull across a sheet to project on. Luis worked really well in scaling these clips to the sheet on VDMX in a way that worked seamlessly when the sheet was again removed. Our final step was to set up all the projectors with the Matrox TripleHead2Go. This took a great deal of time to get working so we didn't really get to have a full run through before the performance. We improvised well however during the run throughs helping to queue Luis for when to transition between clips. This worked really well and the fading of the lights and projections as one became good signifiers for when to change clips. 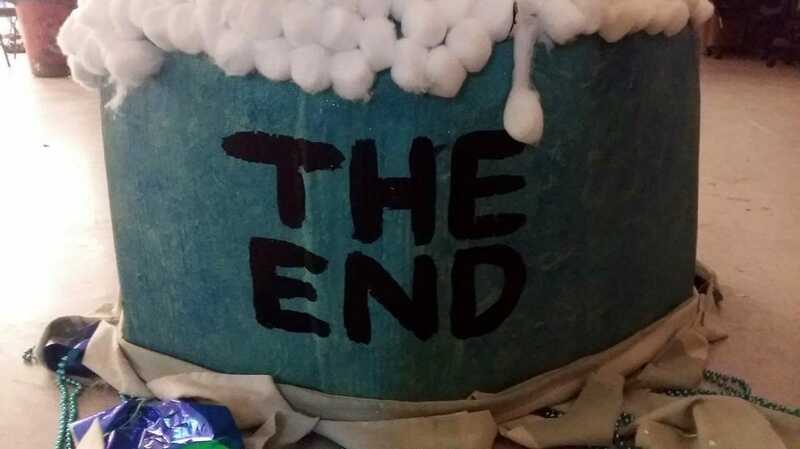 It also marked the end of each scene really successfully. The coloured gels we selected in the lights also worked well in generating a sense of warmth and tone. The lilac filter in the front fresnel really enhanced the pinks within the costumes while the blue filter on the opposite side bought out the blues. We decided we could not backlight the characters for health and safety reasons; the light was to be placed behind the set however this needed to be clear for the actors to move around. We therefore had four barndoor fresnels, two from the side and two from each front corner which worked well in not interfering with the projectors but lighting the figures in an ambient way. Scene 7 - Full Screen - Salt zoom layered with inverted topography (looped) - this clip is smooth in motion and draws the play to a close. The clip is desolate and isolating reflecting the fact that Q is now alone. With this in mind, I sent all the files to Luis who put them into a program called VDMX. This piece of software allows you to queue and transition between clips with ease. It also plays each clip on a loop which was really helpful as we were unsure how long each scene would last. Fortunately also, the software allows you to scale and edit clips within. This meant we could adapt the brightness and so on of each clip to ensure it wasn't overpowering the set or the actors. The following day we set up in the performance studio to test out some lighting. The first hour or two focussed mainly on health and safety though it was clear this was necessary as the lights did not have many safety features so it was imperative to understand and educate everyone. Jim took us through a number of different lights from barn door fresnels to spot lights to flood lights to give us an idea of what could work best. 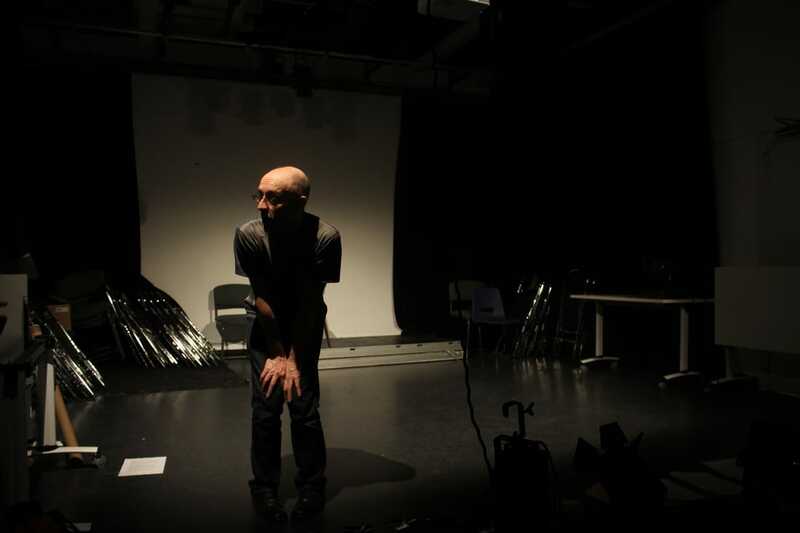 We began to understand the importance of directional lighting as Jim demonstrated the effects of each. As a result, we found the triangular approach to suit our ideas best. This lit the actor from 3 directions, one in either corner in front and a backlight. The diagonal lighting caused shadows to appear on the face making the actor look more 3 dimensional. 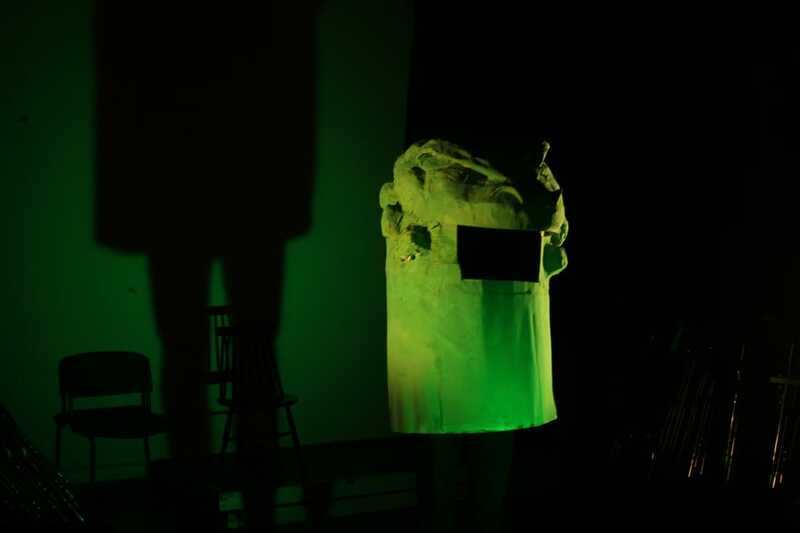 The backlight added depth and highlights around the edge of the performer making them appear to glow which could enhance the imaginative aesthetic the play had adopted. In addition to the triangular directional lighting, we decided we'd like a spotlight. During the workshop we were delivered a copy of the finalised script which detailed a scene where Qwfwq was to perform a monologue. This involved only him on the stage. We felt we could enhance this sense of isolation further using a spotlight so we decided to do this. Finally we explored colour within the fresnels. This was an easy process and simply involves slotting the filters behind the barndoors in front of the light. 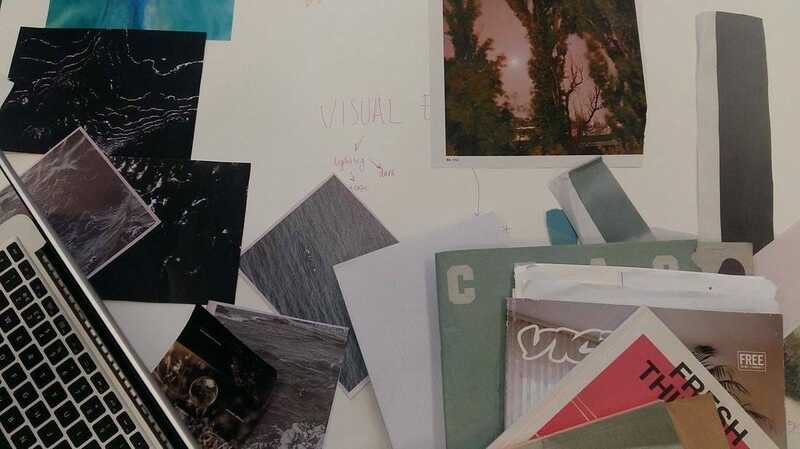 Below shows documentation of a selection of ideas we tried. Jim showed us how the coloured filters could saturate a colour and make it glow which is clearly apparent in the green gel filter image below where the colour green is heightened. At the end of the session we booked out 4 barndoor fresnel lights, 4 stands, 4 cables, a dimmer board to control the lights and a selection of gel filters. As the set was entirely finished we didn't know what colours would work best so a selection would enable us to experiment next week when the set had been finalised. We began the next day with a multitude of technical difficulties. Jeremy suggested we use a Matrox TripleHead2Go, an adapter that allows for a combination of projecters dividing up an image and piecing it back together to create a width two or three times the original animation. This would be greatly beneficial for our projections as the set was very large and wider than it was in height. We experimented first using only two projectors. This was successful as it covered the width of the set however the cones within the projectors meant a large area of the center of the stage was covered in darkness where the two projectors did not intersect. This meant we needed to work on inserting a third projector to fill the gap. For some reason also, the Matrox software didn't center the animations at first. We therefore mocked up a version of our animations where the images were aligned on the left in order to sit in the middle on the software. We're still unsure why this happened however the problem rectified itself the following day and we returned back to the original animations where the images were centered. At this time we also decided it necessary to change our animations by dividing the screen into land and sea. This would allow us to match the division to the physical division on the stage so all land would be projected on the land and all sea on the sea. This was surprisingly easy and worked really well. It was great to see the contrast between the movements in each section to enhance the conflict between the two areas within the narrative. With the lights turned down in the studio, the effect was enhanced further. The contrast in the black and white animations we made became exaggerated and therefore far more powerful. We were aware the actors could not be seen however we had a lighting workshop the following day where we would learn how to light the performers in a way that did not impact the success of the projections. We hoped to enhance the ambience with our lighting and perhaps saturate the colours of the stage further with gel coloured filters to suggest warmth and coolness. In addition to the visual aspects of the play, we were all asked to produce a poster to advertise. I created mine using a combination of analogue and digital processes by finger painting the tadpole figures and compositing them together on Photoshop with a background and texture. I felt the handmade aspect was important; I wanted my poster to reflect the hardwork that had been put into the creation of the play and how we have used our hands to sculpt and make everything. I feel the finger painting technique alongside the highly textured background does this. I was unsure on what colouring to use. As far as I was aware the main colours being used on the set were blue and green however, when presenting the poster, many felt the colours were not vibrant or playful enough. I therefore adapted the colour scheme to add saturation and a sense of imagination. Projection mapping, also known as spatial augmented reality, is a projection technology used to turn objects, often irregularly shaped, into a display surface for video projection. By using specialized software, a two- or three-dimensional object is spatially mapped on the virtual program which mimics the real environment it is to be projected on. 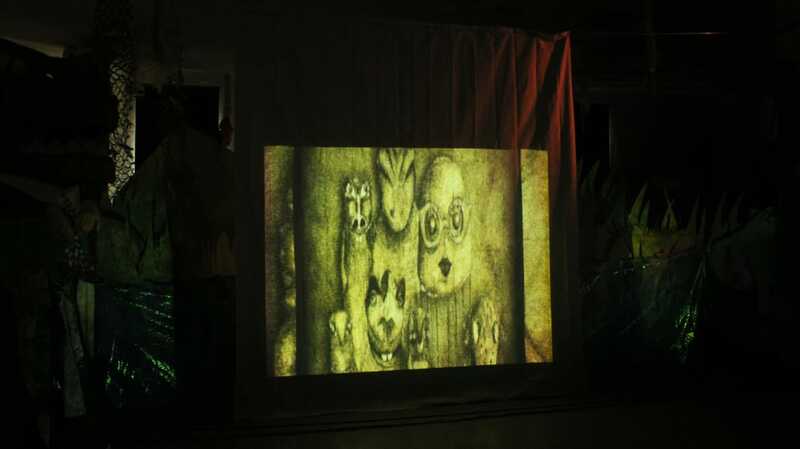 The software can interact with a projector to fit any desired image onto the surface of that object. This technique is used to add extra dimensions, optical illusions, and notions of movement onto previously static objects. Klaus is an electronic musician and Austrian digital artist, creator of many multimedia and cross-media works. Dancing House (left) is an interactive projection mapping and sound installation. 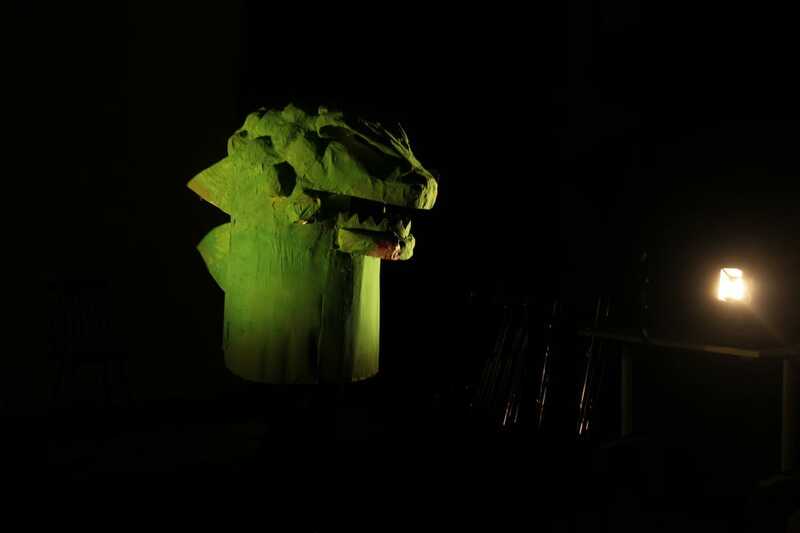 Interactive projection mapping goes beyond passive reception by creating an immersive and communicative experience. Only through the active participation of the visitors and their playful use, the artwork comes alive. In Dancing House the users are called upon to move, to jump, and thereby bringing the building and themselves to dance. Using this technique in its most basic form I began exploring how we could map the sea animations on only the sea and land animations on only the land. 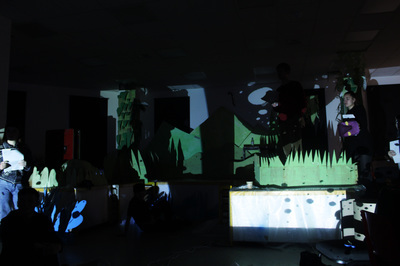 I made a basic replica of the set layout we were to use for the performance and photographed it from the position of the projector. 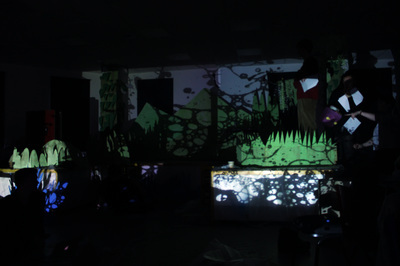 I then mapped out the areas where the projection needed to be visible and overlaid the animation in only these shapes. 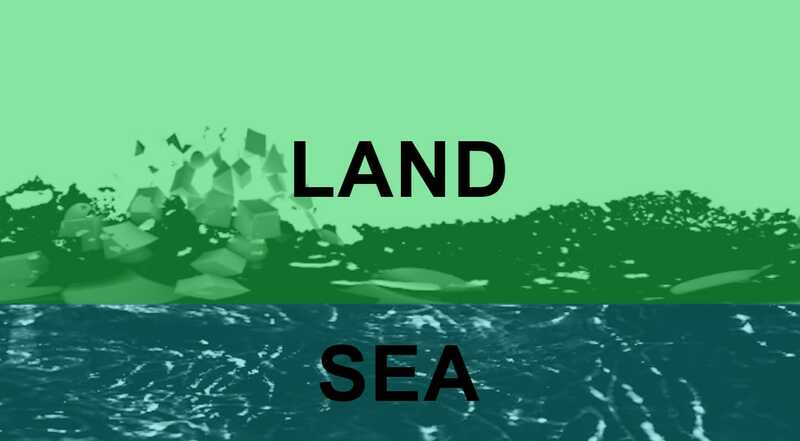 This meant to animation should only play within the boundaries I set and therefore fit the shape of the set in terms of land and sea. Below shows my documentation of these tests. I began with basic full length and width projections over the entire set and then honed in and refined the animations to the projection mapped areas. I found the projection mapped version (bottom) far more successful. It created a real distinction between the land and sea, an element of the story I felt was important as this is where the conflict occurrs. 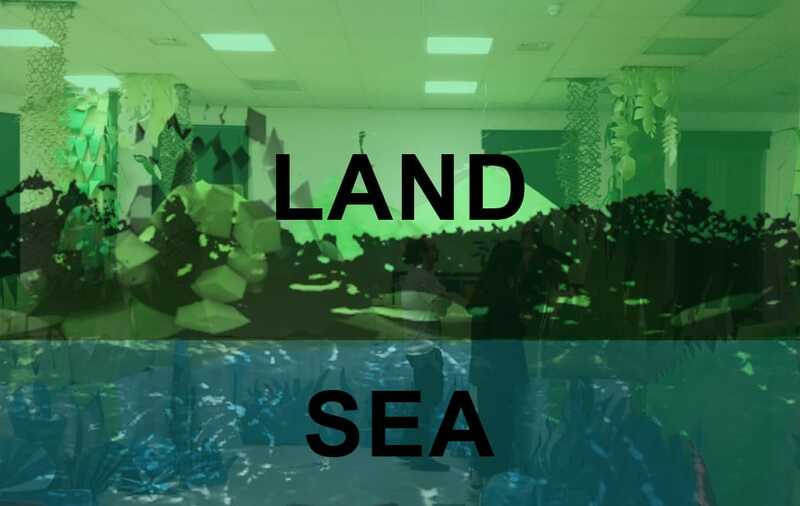 To improve we could extend the sea area the full width as this will also be part of the sea however no action takes place in these areas so we would need to discuss this further with the actors as the play progresses. Between Jess and myself, we now had a large number of clips to use for the sea section of the script. Since a few people within our group hadn't been showing up or were unwell, I began considering some animations for the land aspects. As a group we decided we wanted a clear difference between the land and sea clips in order to enhance this divide within the narrative. To do this I wanted to convey opposing shapes to the fluid, circular motions of the sea. I therefore began exploring the ideas of geometric, harsh shapes. Kimchi and Chips create an architectural web of threads to convey a null space. The installation hangs abstract and undefined as a set of thin positive elements segmenting the dark negative space between. Dynamic imaginary forms are articulated into the physical volume by the material of this thread and the light creates contrast and order on the lines to articulate digital matter. 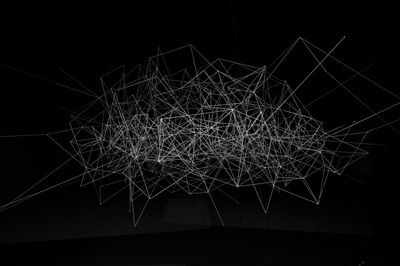 The overlap of the threads to create a geometric, corner driven shape contrasts the fluid shapes of the sea animations. I plan to create an animation for the land utilising similar shapes and ideas to suggest inhabitants of the land as mentioned in the script in addition to surfaces. 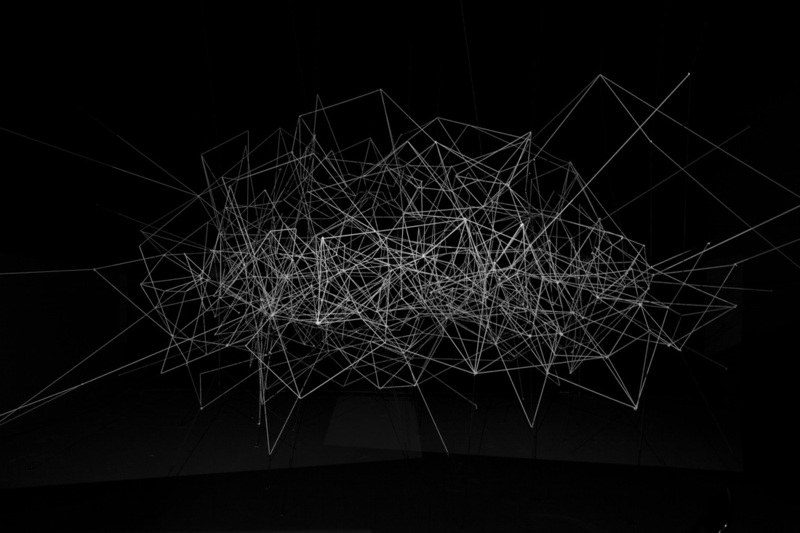 Line Segments Space 2014 from Mimi Son on Vimeo. To create my own version interpretation, I set up a number of threads in my room, tied randomly. 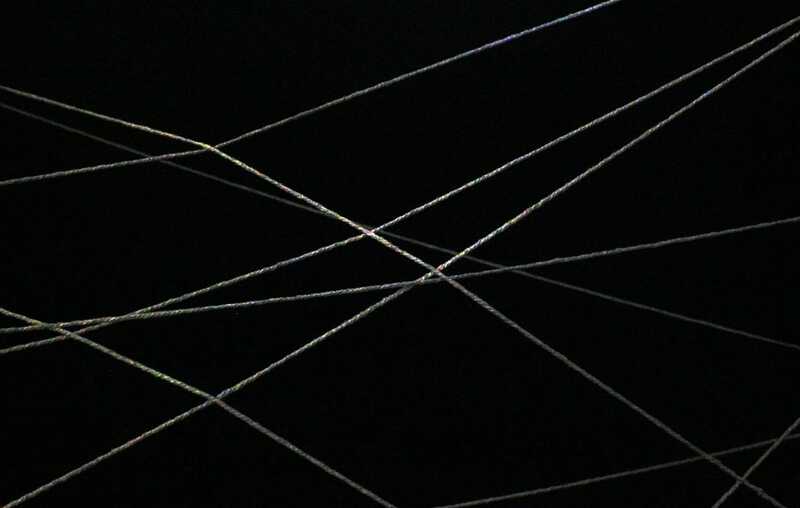 The strings intersected and sat in front of a black background. I switched off all the lights and blacked out my window. I then ran the light of a torch up and down each string with my camera set on a low ISO thus to only see the illuminated sections of thread. Once I'd gathered all my clips, I began putting them together, layering some. This created a sense of life within the geometric shapes which contrasted the water animations. As the light travels along the string, it seems to suggest a burst of motion like an animal running through the trees. I feel this animation could also be easily adapted to suit the sea sections of the script by warping the shapes into more fluid ones to suggest fish underwater. Having this animation run through both sections (land and sea) of the performance could help to maintain a recurrent image to tie everything together. The sound in the video I created below is extremely influential in conveying an atmosphere and highlights the importance of discussing our work with the sound team. I obtained my sound from freemusicarchive.com however, as far as I am aware, the sound team plan to perform live on the night of the performance. I feel this is a good idea as it'll link to our handmade processes whilst also being more ambient and atmospheric than prerecorded material. 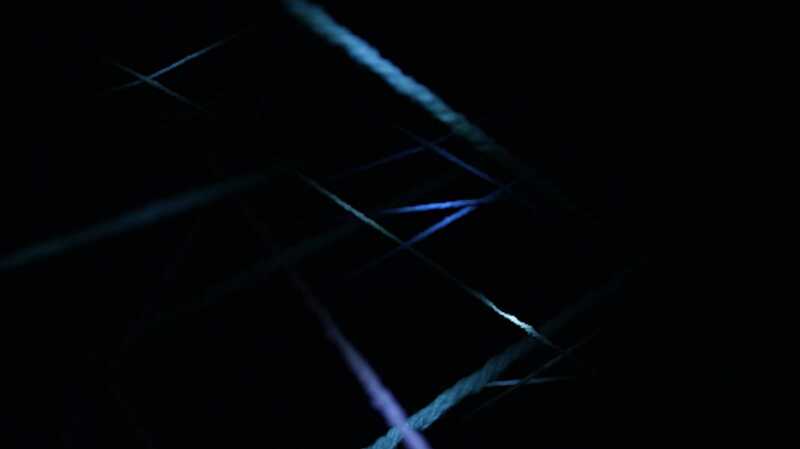 Geometric Light Experiment from Tash Tully on Vimeo. Using the footage from the film above, I adapted it into a water representation using the 'polar coordinate' function. This created curved variations of the geometric string creating what appears to be shoots of water like a fountain. Layering this atop some of the water animations and the geometric versions atop land animations could create a sense of continuity and thus bring together the entire visual projections. In addition to the string experiments, I began playing with more geometric shapes in a slightly more explicit sense. Again, I used footage from past projects where I played sound beneath a sheet of paper with charcoal on top to create bursts of movement. This movement is uncontrolled and allowed the larger segments of charcoal to disperse in an erratic way. I zoomed in on the film to create more abstract animations. As well as zooming in, I used the same polar coordinate function in After Effects as before to map the shapes from circular to horizontal. This caused the animations below and began to represent more land-like imagery such as mountains and canyons. The motion is created by using keyframes in the mapping as well as the motion from the original clips above. The mountains appear to grow and shrink creating some animations which feel soothing and others that are unnerving and aggrevating. We could apply these animations to relevant scenes within the story such as placing the more anger-inducing clips in scenes of angst and annoyance and more soothing clips in scenes of peace and tranquility. Finally I created animations with an explicit reference to geometric shapes. I modelled in Cinema 4D using a cluster of cubes, spheres and pyramids colliding. Again I explored the polar coordinates setting in After Effects to map the shape from circular to horizontal creating a depiction of mountains gaining and shrinking. The further into the video below you watch, the more abstract the shapes become. I felt the initial geometric shapes were perhaps too obvious and needed mystifying slightly so I played around in blending modes until the shapes became more irregular. I feel the energy in these animations would be good for more high energy sections of the script such as when Lll and Qwfwq run around the stage; the shapes and motions will mimic their movement. Since we had now developed a number of animations which experimented with the depiction of the sea, I began researching artists who work with such fluidity. 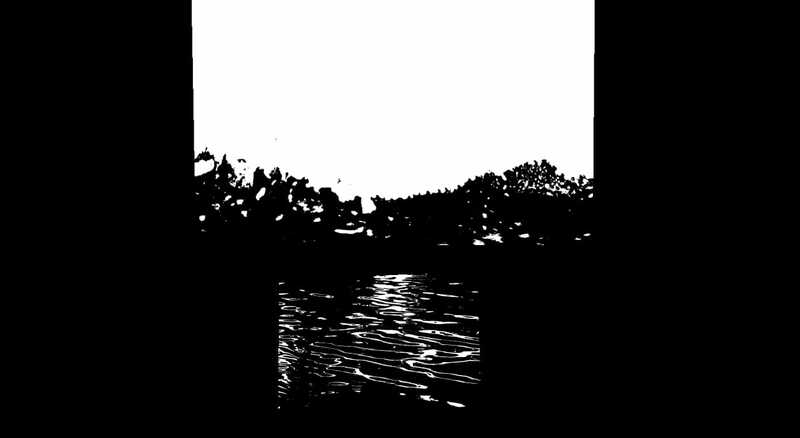 I wanted to create a number of animation which advanced my ideas of fluidity but presented water in a more abstract way playing with the ideas of light since we were to use a projector. 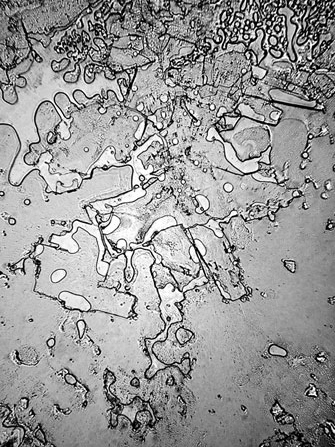 Fisher's images below entitled the Topography of Tears shows a study of more than one hundred tears photographed through an optical microscope. 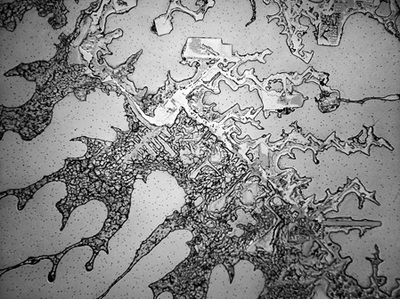 Fisher set out to explore different types of tears using science to make art. I particularly liked the way these images felt congruent with the growth and fusion of cells as discussed in the opening sequence to represent the evolutionary concept within the story of The Aquatic Uncle. 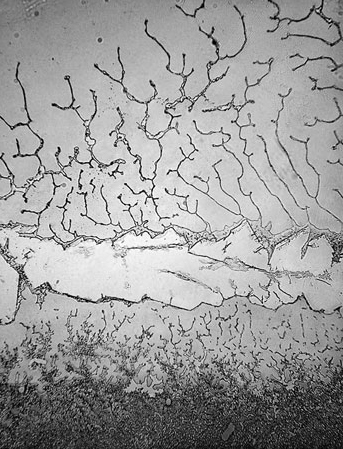 I also like the use of water as a material to create visual images which are more abstract. The title of Fisher's photographs also alterted me to the idea of combining surfaces with light to produce an abstact representation of water. The word topography means 'the distribution of parts or features on the surface of or within an organ or organism.' I therefore began an exploration into light on a surface. In turn Jess alerted me to the video below. Ólafur Arnalds & Nils Frahm - Four from Misha Shyukin on Vimeo. 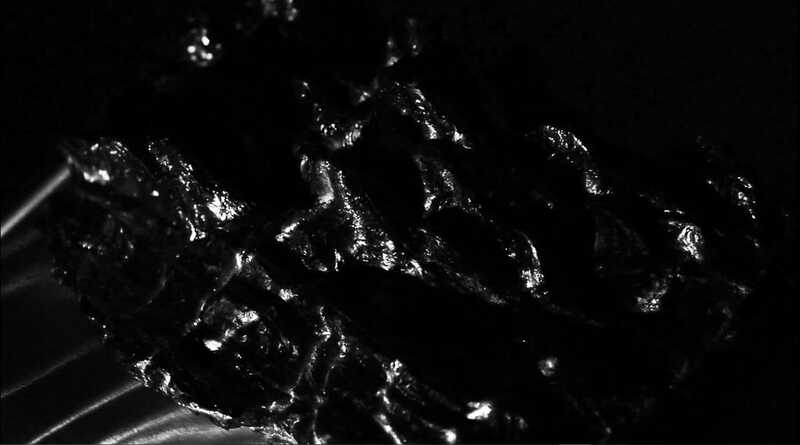 The video above is created by Misha Shyukin and shows a CG light projection technique that is used to illuminate and explore the surface from the top and later the bottom of a dark and barren terrain. Using light in this way appears like water, and in combination with sound, is magical and atmospheric. 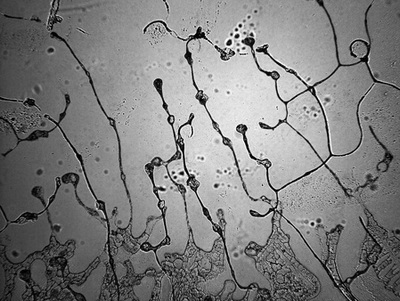 To explore this myself I followed the same process as with my initial experiments. I began with a static image, in this instance a topographic map made up of contour lines. I then placed a displacement map and utilised the ripple effect on After Effects to animate the image to look fluid and water-like. I wasn't happy with the first animation so I played around with perspective until I found an angle I preferred. I then projected this animation onto a surface. I wanted to use a surface that was reflective as I felt this would enhance the atmosphere and water-like qualities. Last year I created an object using pewter. This was highly textured and reflective. I therefore projected the topographic animation above onto this object and filmed the reaction. The outcome is below. I combined the film with sound which made the light appear to dance adding to the sense of fluidity. As a stand alone film, I am really proud of the outcome. It is greatly atmospheric and provokes and emotional response in the viewer. This sense of atmosphere will hopefully transfer well to the set and the actors to enhance the immersion of the audience. 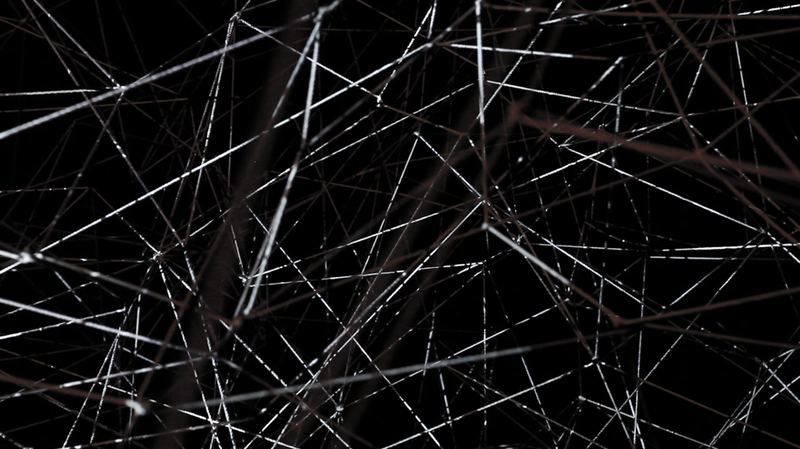 Topography Light Experiment from Tash Tully on Vimeo. The following day, Jess and I worked together to create some more animations, combining the ideas we'd each created over the last evening. 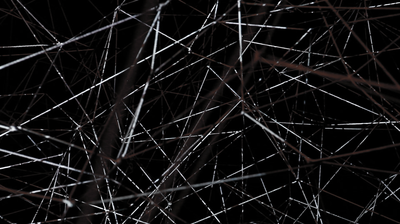 We began researching more advanced processes on After Effects such as displacement mapping. To do this, we followed a number of tutorial videos on Youtube and applied what we'd learnt to our ideas. Using photographs I had taken, we repeated the process of animating a still image that I'd discovered last night. The images show two lenticular grids one on top of the other. This creates an effect called the Moire Effect however, to me, it looks fluid and like light hitting the peak of a wave. With these images, we applied the displacement map to a layer of water rippling. The image on the layer above then maps the motion of the below layer to give the image some motion. 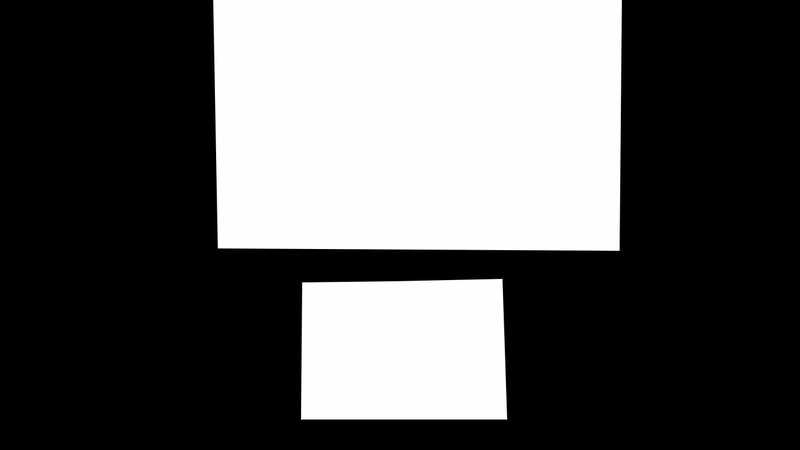 Since the below layer is fluid, the image appears more like water as you can see below. Following the displacement tests above, we began shooting additional ideas for our representation of water. We were made aware by the set department that a blue/purple, iridescent fabric was to be draped across the front of the stage. 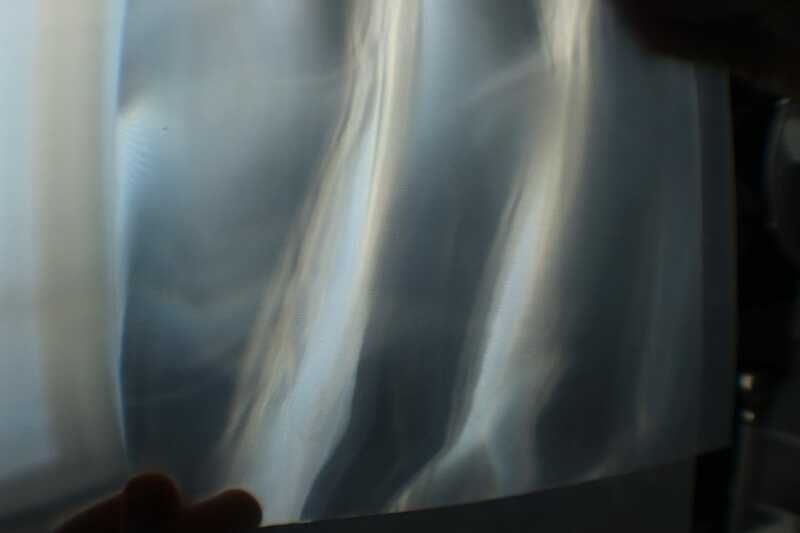 We therefore began filming our current projections on the fabric to see how the light reacted. 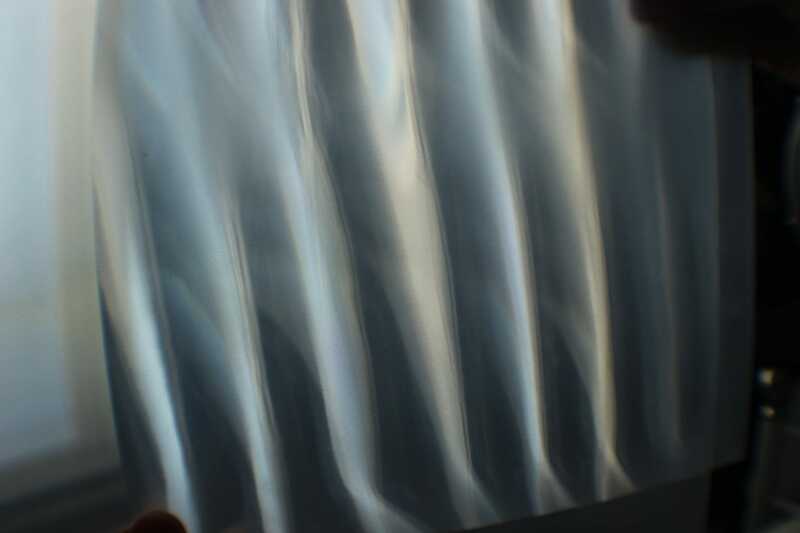 In turn, we found the fabric to enhance the projections causing lights to reflect and disperse. In addition, the light flowing across the fabric also seemed to depict water itself so we filmed the outcome as footage to project on the set. During our experiments we received a message saying how the set was now to be entirely white and thus our projections need to install the colour. We were given the following palette. The last clip in the video below shows a consideration of this colour palette utilising the green and blue. On the first day of the project it was clear the majority of the class wanted to persue the project dealing with the story in a more explicit way. Up until now I had reinvisioned the story from an alternative perspective, dealing with themes of technology and robotics however, the majority of the class went down a similar route to the original story utilising the lagoon and desert and so on. Although this felt like a step backwards for me, I soon realised I could still use elements of light play found in my moodboard. During the first session we met as a group and discussed our ideas. Most of what I presented I thought of on the day since I'd explored other themes however we seemed to gel well as a group and all had similar ideas in terms of using analogue techniques and experimental processes. We decided here to break off into smaller groups where 2 members of the group dealt with an opening sequence, two dealt with land videos and 2 with the sea section. I was to deal with sea. We would create ideas throughout the evening and during tomorrow's session and combine our ideas in the end to ensure a consistent aesthetic. Below showed the sorts of ideas we wanted to explore. 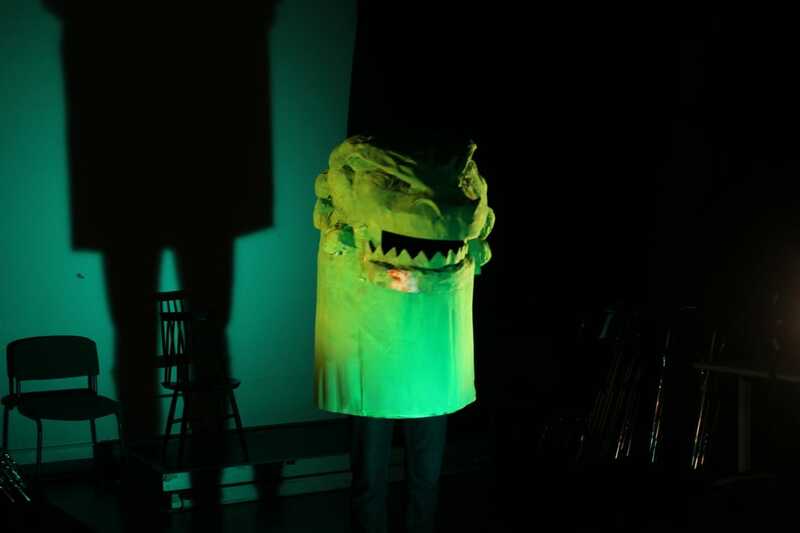 glonkq from Misha Shyukin on Vimeo. ​The above video shows the use of liquidity and flow to suggest water. It also includes elements that could be construde as land-like enabling us to think how we could transition from one to the other. The sound also works really well in combination and the two together appear to control one and other. I would hope the sound team's idea would work with similar congruence. Overall, we take from this film the abstract nature. We felt that highly detailed projections onto the set would become lost and therefore, more abstract imagery would work best in creating an atmosphere. 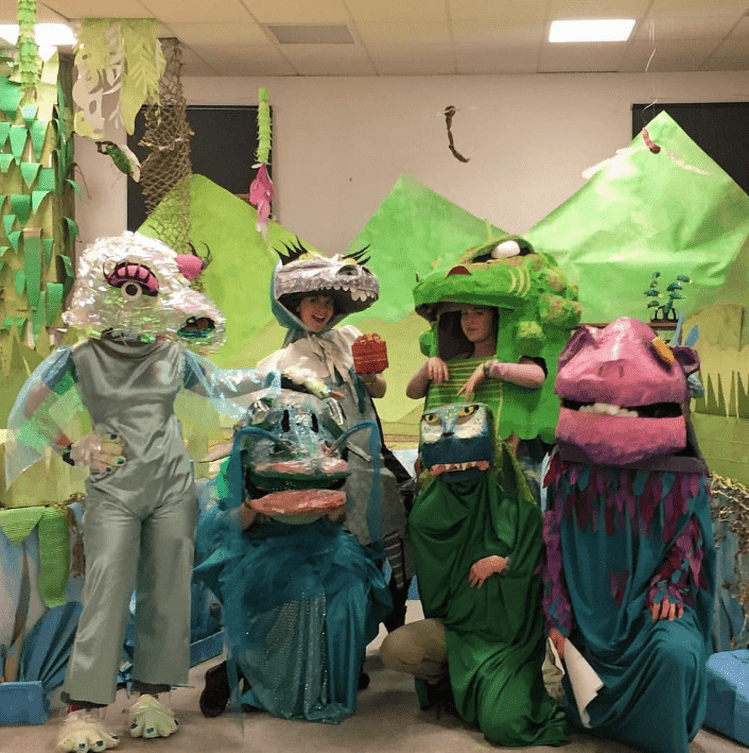 It was also clear talking to other departments such as costume and performance that the main communication of the story would rely on the acting not the visuals so our main aim was to create an atmosphere rather than a figurative depiction of events. In terms of the opening sequence, I suggested the group looked at the video above. 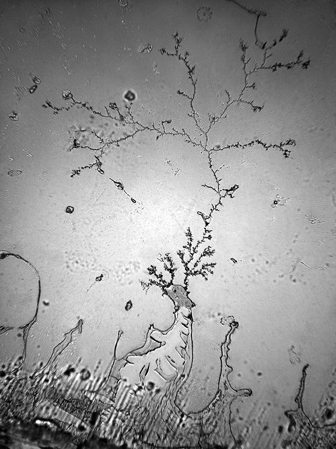 It shows what looks like organisms growing and fusing together which linked well to the evolutionary aspect of the story. The video is clearly rendered using an advanced animation software which we were unlikely to achieve a video of the same standard however, the aspect of growth and algamation we extracted. Since I was working on the sea elements, that evening I began putting together some basic, abstract animations. Since time was limited, I began using photographs and short films I had worked on it the past. 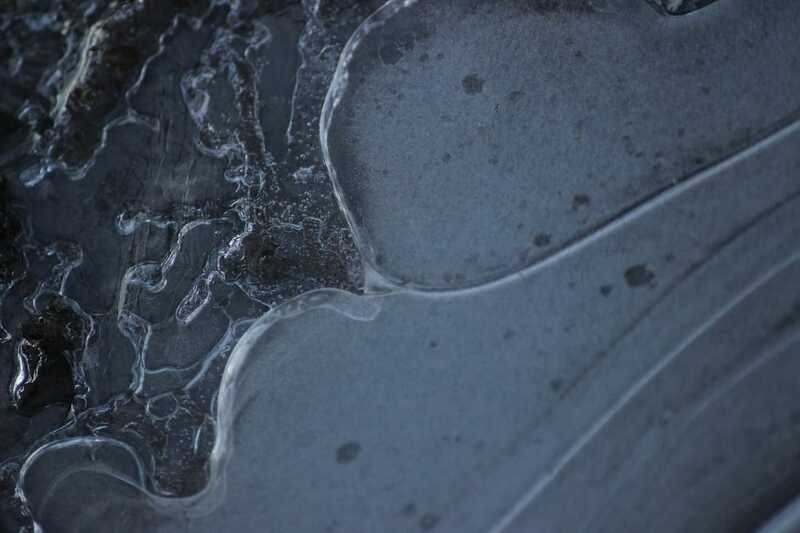 With the film I had of water and the photographs of frozen puddles I began playing around in Adobe After Effects. With the film I simply changed the threshold to create a binary black and white film. This increased the abstraction and reduced the detail within the film. We'd also decided after a discussion with the set department that all our animations would be in black and white since the set would be decorated in bright colours. With the puddle images I also converted them to black and white. I then applied effects such as 'displacement map', 'ripple' and 'wave' which animated what was once a still image. This gave the images motion and appeared to present a surface of water rippling. The clips at the end of the video below are my favourite. They're subtle and the motion is more realistic than some of the earlier clips. Although alone these are my favourites, they may not be the best for the projections as the motion may be too minimal. This is something we would need to test on the set. Having read the text for a second and third time, I managed to form a complete reinterpretation of the story's meaning in relation to technology and the modern day. By breaking the narrative down into the component symbols as I did at the end of the previous post, I was able to replace each with its modern day equivalent then fill in the necessary gaps. I concluded that Great-uncle N'ba N'ga represents an older generation, similar to the original narrative however, instead of refusing to advance to a land-dwelling creature, N'ba N'ga now refuses to touch any sort of technology because he has his own ways, which seem to work well enough for him. I feel this is a relatable narrative which is largely honest to today's society where the older generation appear to fear new technology and feel a safety and comfort in the old. Having also mistaken Lll's name for L11 ("ell eleven") I cant help but think I was coerced into this technological interpretation from the outset. Lll, in my version of the narrative therefore becomes a symbol for the most advanced technology to date such as a robot having roots in humanity much like Lll in the original who dwells on land with roots in the water. Qwfwq, in order to admire Lll and in keep a congruence to the narrative must be of a similar being to Lll but lesser developed. I therefore imagine him as a robot but one less advanced. This could be suggested through hanging wires or an incomplete appearance where his human and robotic qualities clash to make him less useful. Consideration of sound could include the squeaking of joints also. Drawing further on the symbols I identified from Calvino's work I began thinking about how my version would represent paws, tadpoles and edges. 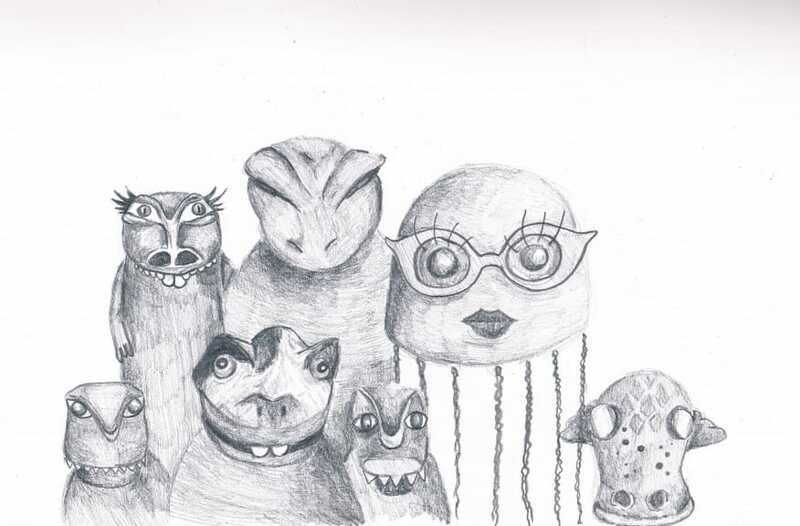 In the original narrative, Lll had paws to symbolise her being most evolved and therefore most superior. 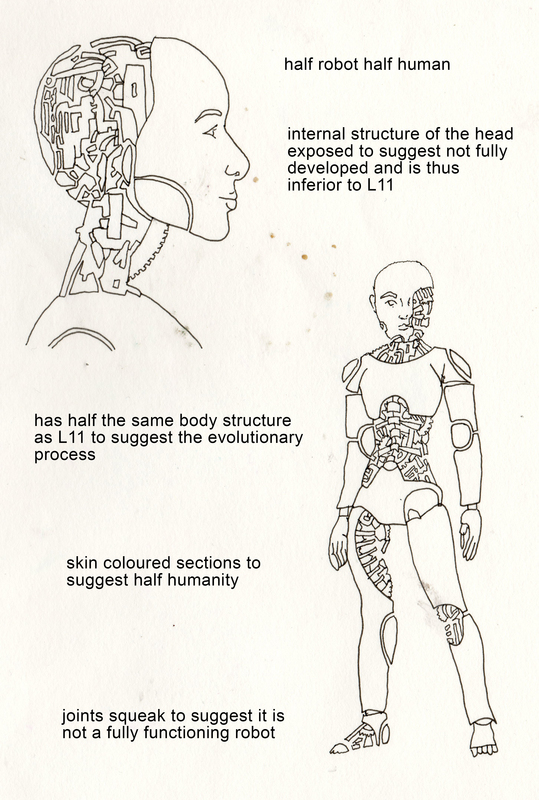 In replacement for paws, Lll, in my narrative, is most advanced through her appearance also using the colours white and silver to suggest a complete robot. 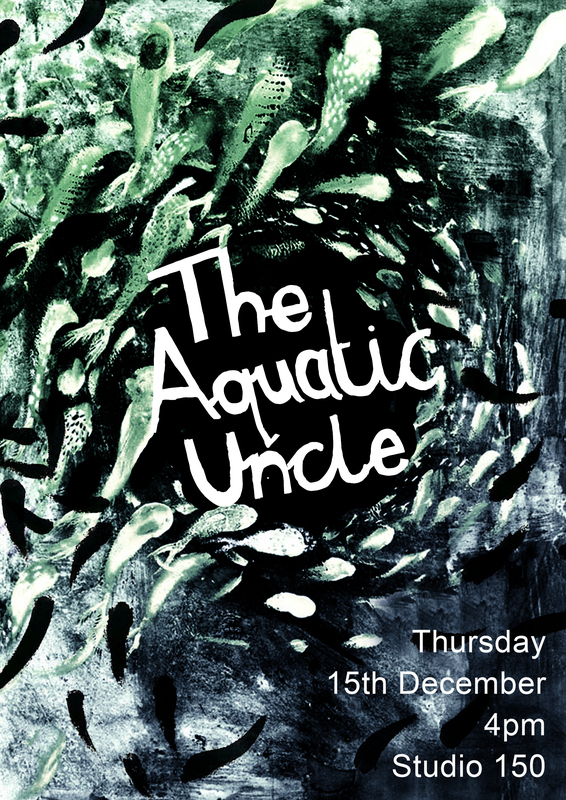 The tadpoles within the narrative symbolise the transition between water and land in a sense of the undesirable. Tadpoles are symbolic of immaturity, of someone who is naive and ignorant of the land way of life and, as such, the modern way of living. This is symbolised in my narrative through the hanging wires in Qwfwq's body. This suggests a transitional period between a human and a robot, one which suggests he is not intelligent enough to be fully robotic. 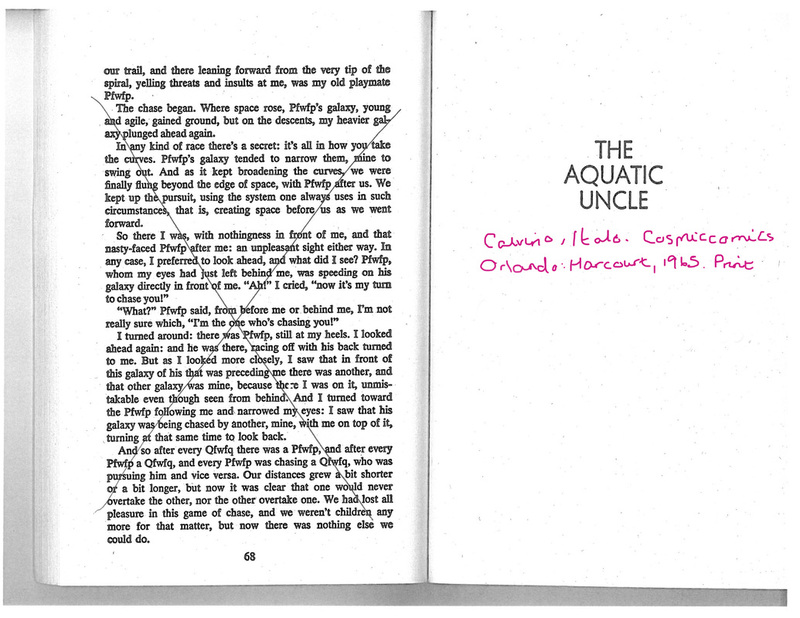 The repetition of edges in Calvino's story suggest a divide in society and how playing along such edges will result in falling to one side or the other. This I aim to keep the same just symbolise the divide between humanity and technology. To refer to this visually, I could again use a representation of an edge or, alternatively the use of portals. Portals symbolise a threshold, a space between two places, in this case the human world and the technological. By crossing the portal, you make the choice to cross into the other world. In terms of the narrative, N'ba N'ga constantly tries to get Lll and Qwfwq to cross into the water, in my story the human world. Qwfwq attempts to get him on land, in my story the technological world. 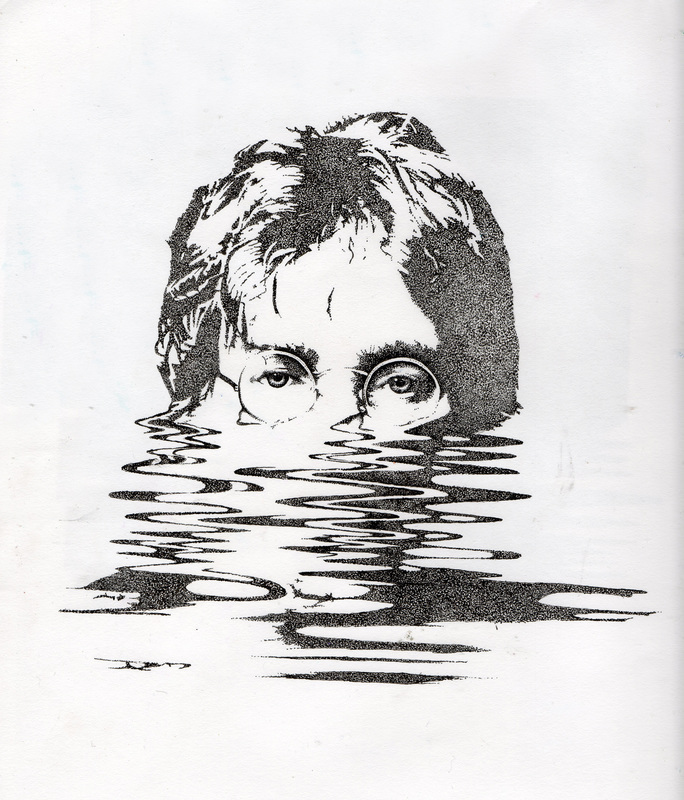 Lll remains conflicted in the center but finally resides in the water, the human world, where her original roots lay. The portal acts as a technological version of the edge Calvino refers to. ​In The Aquatic Uncle an amphibian is embarrassed by his great-uncle, still living as a fish after the rest of the species has evolved into land dwellers. He needs to introduce his lover to his family, and is ashamed at the prospect of her meeting his fishy forbear. 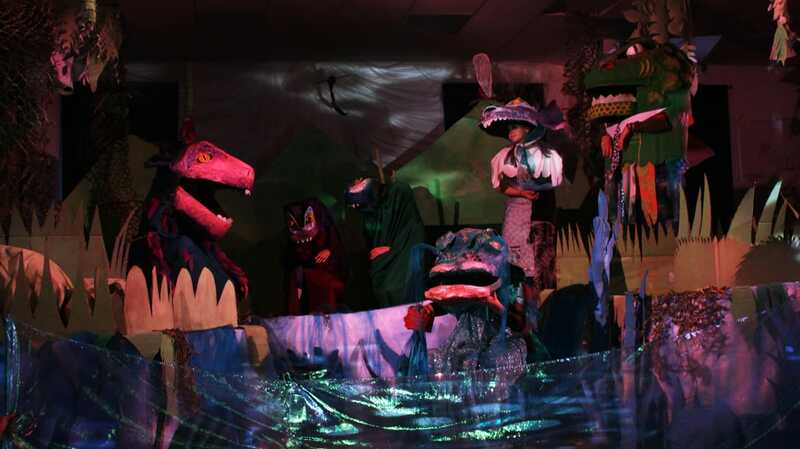 The narrator of the story, Qwfwq plays the character of a fish/lizard that is able to survive on both land and water, preferring land. During his time on land, he falls in love with a fellow land dweller, Lll however Lll is far more equipped to live on land and Qwfwq therefore admires her greatly. The pair spent time together constantly "Lll and I spent our days together, chasing each other...We ventured into zones of the inferior where no print marked the dry and crust” (Calvino 74). Qwfwq longed to be with Lll and, had Qwfwq not loved Lll, he would not have gone beyond his comfort zones. The story continues where Qwfwq brings Lll to meet his uncle Nba Nga to get a blessing for his marriage. Unfortunately, Nba Nga refuses and tries to talk Lll back into water life. During this time, Lll deals with many questions about her life and begins to ignore Qwfwq making him feel afraid of losing her. He attempts to win her back by impressing her with his abilities. "Had I lost her? Suspecting this, I hastened to woo her back. I took to performing all sorts of feats...Unfortunately when I did something brave, she wasn’t there to see mee...” (Calvino 80). Qwfwq continued to risk his life doing dangerous stunts for her love. 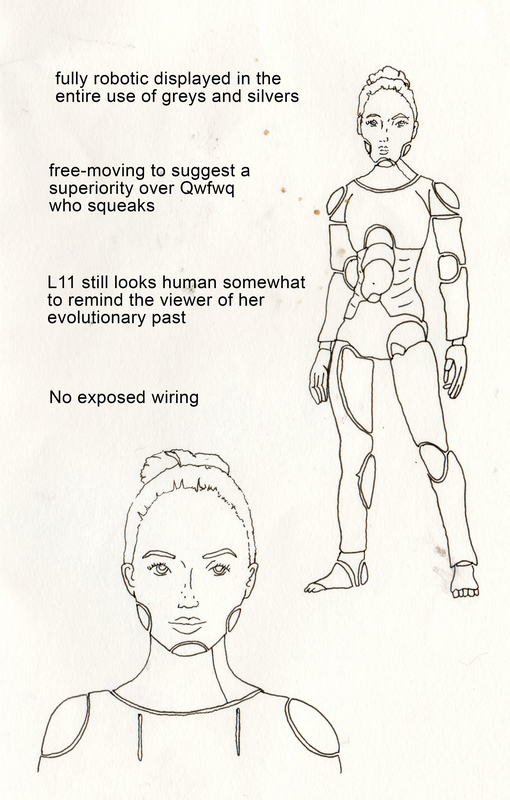 Sadly, Lll was too deep in her thoughts to pick up on Qwfwq’s actions. This entire time, Qwfwq should have been comforting her yet he chose the wrong actions at the wrong time which cost him his love. In addition to the reading above, I feel the story has symbols parallel to modern life. It could be argued that the consideration of the science behind the “Carboniferous period, abandoned aquatic life for terrestrial” is merely a metaphor for society moving into modernity, leaving behind an old way of living. ​Other symbols include “paws” as a code for the highest adaptation achieved at the point of the story. This is made clear due to Qwfwq’s admiration of such quality in Lll. The tadpoles within the narrative symbolise the transition between water and land in a sense of the undesirable. Tadpoles are symbolic of immaturity, of someone who is naive and ignorant of the land way of life and, as such, the modern way of living. This is made clear in Qwfwq’s embarrassment at aquatic life instead of embracing the two worlds as one. Great uncle N’ba N’ga is symbolic of past ages from the perspective that, what is once considered old will one day become new again. This is made clear when Qwfwq chooses to return to the water where she sees the future in Great-uncle N’ba N’ga. Finally, the repetition of edges suggest a divide in society and how playing along such edges will result in falling to one side or the other. It could be an interesting recreation of this story to replace the symbols I have identified with a modern-day example to re-interpret the narrative yet still inkeeping with the overall message. Themes and ideas could circulate topics such as technology or robotics and present a satiric, modernist impression of the narrative.